Maya Chinchilla is a Guatemalan, Bay Area-based writer, video artist, educator and author of “The Cha Cha Files: A Chapina Poética.” Maya received her MFA in English and Creative Writing from Mills College and her undergraduate degree from University of California, Santa Cruz, where she also founded and co-edited the annual publication, La Revista. Maya writes and performs poetry that explores themes of historical memory, heartbreak, tenderness, sexuality, and alternative futures. Her work —sassy, witty, performative, and self-aware— draws on a tradition of truth-telling and poking fun at the wounds we carry. Maya Chinchilla is a Central American/Guatemalan poet performer, video artist, and educator. She is a founding member of the performance group Las Manas, and has over 15 years of performance, teatro, and curation experience. Her work deals with themes of historical memory, laughter in heartbreak, family secrets, joy, love, ferocity, tenderness, and ultimately the fight for justice and the telling of our own stories. 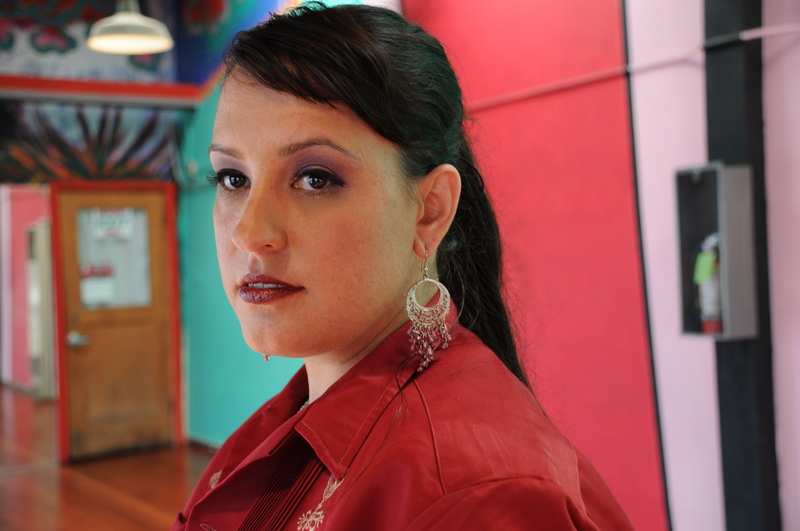 In 2013-2014 Maya was invited to perform at “Our Mission, No Eviction” at the Brava Theater, the San Francisco Lit Crawl, the “Lunada Literary Lounge” at Galeria de La Raza as a featured poet and at MCCLA’s International Women’s Day Celebration on March 8; the 2014 San Francisco Jazz Festival (featuring poet laureate Alejandro Murguia) April 4; the Bay Area Latino Poetry Festival April 12 and will was featured in the Cipactli Literary Journal published by SFSU’s Latina/o studies department. She founded and co-edited La Revista at UC Santa Cruz, co-edited Desde El Epicentro: An anthology of Central American Poetry with Karina Oliva and has published her work in Las Girlfriends, Stanford’s Americas y Latinas, Mujeres de Maiz, Sinister Wisdom, Turtle Island to Abya Yala: A Love Anthology of Art and Poetry by Native American and Latina Women, and most recently the MALCS blog Mujeres Talk. Maya is a Central American/Guatemalan poet performer, video artist, and educator. She is a founding member of the performance group “Las Manas” and has curated artistic events investigating and celebrating the intersection of politics, media and art for more than 15 years. She has collaborated with and performed as part of several poetic, performative, theater collectives over the years and was an artist-in-residence at Galeria de la Raza and La Peña Cultural Center. She founded and co-edited La Revista at UC Santa Cruz and has published her work in Las Girlfriends, Stanford’s Americas y Latinas, Mujeres de Maiz, Sinister Wisdom and most recently Turtle Island to Abya Yala: A Love Anthology of Art and Poetry by Native American and Latina Women. Her most recent video project “SOLIDARITY BABY” is the poetic journey of a child of the Central American solidarity movement who uses her poetry and images from memories to build bridges between her family history and present day immigrant rights struggles; made with the support of the San Francisco Film Arts STAND Award and QWOCMAP. She is the co-editor of a collection of U.S. Central American poetry, is currently working on a book of poetic non-fiction, and teaches classes with intersections of literature, creative writing, gender, immigration, Chicano/a, Latino/a, Central American, culture and history at SFSU. Maya is an artist for hire and is available for performances, lectures and workshops. Hey muxer! When is your troupes next performance? Or when and where might I catch you and some of the 74 of the anthology? I need to pick it up for sure but right now I am reading ‘Venas Abiertas de Latino America’ and others. Bueno pues, good luck on your finals! I’m sure you’ll rock them. Oh and are you going to Adelina Anthony’s ‘La Sad Girl’ at La Pena on May 23rd? Get at me after finals. 😉 Cuidate, Yvonna. Oh yes. I want to go se La Sad Girl. Maybe I’ll see you there? How have I not seen your blog until now?? Ahh, Maya, we must never let each other sleep, for we have the awesomest almost-the same pair o’ names. And actually, by “sleep” I mean “slip.” Irony. I just finished reading “Seeking Community in a Global City: Guatemalans and Salvadorans in Los Angeles” (Hamilton and Chinchilla, 2001) in which they cite from one of your poems. The poem (“Central Americanamerican”) intrigued me. I’d like to discuss it in a paper that I am preparing for the upcoming Northeast MLA conference. My paper will focus on voices of Guatemalan Maya women in the US: which is why, with your permission, I’d like to know a little more about your ethnic self-identification. You are described as being Guatemalan, but do you self-identify as “Ladina” or “Maya” (and if Maya, from which group), or what would you say, generally, as to your relationship with the Guatemalan Maya? Also, are you a native of Guatemala (if so, from which municipality) or were you born in the US? Sorry for the relatively personal questions, but they weren’t addressed in your website, and for the purposes of an academic paper of this nature it would be important for me to be able to address those issues.